"If all else fails, read the instructions!" A dissertation on sources of written information for research into Austrian Postal History, based largely on a presentation given by Dr H Moser to a joint APS-PKMI meeting at WIPA 2008 and on Andy Taylor’s personal experiences in some of Vienna’s less touristic corners. All the sources discussed are "public" in that anyone may read them. However, many are extremely rare, or are found only in an archive to which you must travel. Extraction and publication of the information is the goal of much work currently in progress. Note: all of the illustrations (except a map) have been resized as 800 pixels wide; some have had areas of white space removed. They are large enough even so! The "Laws of Austria", or most of them, are made available to the public in two ways: on paper, and on line. 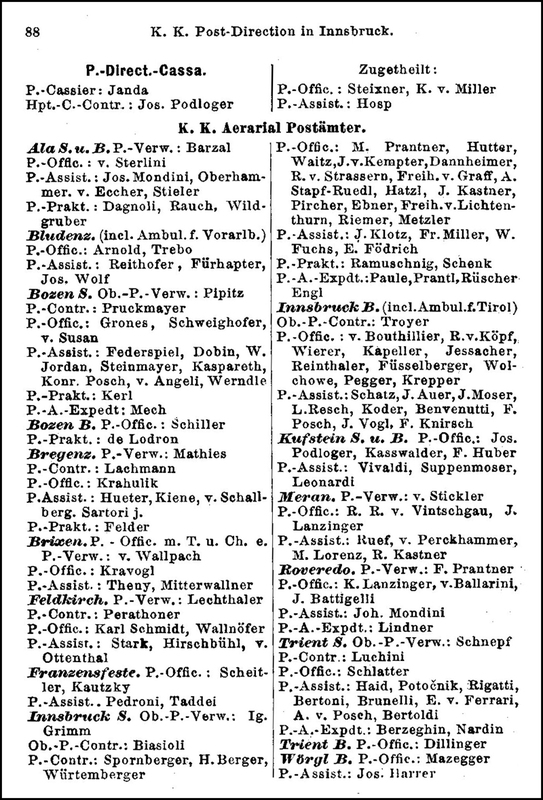 Especially before 1900, a wide variety of titles was used for governmental laws, decrees, edicts and the like, such as Entschließung, Gesetz, Kundmachung, Octroi, or Verordnung. The official repository has at various times been called Justizgesetzsammlung, Reichsgesetzblatt, Staatsgesetzblatt, and Bundesgesetzblatt. The State Archives in Vienna contain paper copies of all that has survived. Their web site http://www.oesta.gv.at/ tells the persistent researcher what is there. Many but not all of the National Archives are in the central archive at Nottendorfer Gasse, A-1030 Vienna. If possible obtain advance guidance by email on the existence and location of what you seek. Find (try the Site Map) and study the page "How to use the archives" on the web site! You have to go there, register (passport! ), and pay the modest fee. If you know the archival reference for what you want, you fill in a document request form; if you don’t, the Duty Archivist will assist as best they can. You hand in the form "and come back later" – it can take 2 working days to fulfil a request. This is why emailing in advance is useful! Some items are referred to in other items but are neither in the index nor in the bundles, so cannot be located. There are understandable restrictions: no photography or scanning; photocopying of older documents has to be done for you; etc. There is an Austrian web site called "ALEX" located at http://alex.onb.ac.at/ which contains the laws of Austria arranged by year. It contains mainly Justice Ministry material up to 1848, after which its coverage expands. Note that ALEX contains images of pages, not searchable text. Use the smallest choice of size when searching for a law; then change to the middle size for downloading. Each page is a PNG file so if you don’t have broadband find a friend who does! Download the image by right-clicking in the usual way; change the file name (eg to year hyphen page) before saving. The alpha and date indexes contain two numbers; the first is the law number, the second in bold is the page number by which the laws are accessed. To aid navigation, open the index in one tab and the pages in another. To view another year, it’s usually quicker to start again from the home page! Note that in 1934 there were two series of laws, both numbered from 1. Note that some pages are intentionally blank apart from a frilly top margin. The database after WWII is arranged differently, and considerable ingenuity can be needed unless you already know the references of what you seek. Until 1938, changes to the regulations governing the post were first announced in full in a Law approved by the Emperor, and then repeated (usually verbatim) in a variously-titled Decree from the Ministry responsible for postal matters. Indeed, in the beginning the law itself would be reissued in each state of the Austrian Empire, possibly with slight variations in wording and often reset (the photocopier hadn't been invented!). As the Laws are accessible on-line while the Decrees are not, it is easier to follow the changes as Laws; cross-checking against the Decrees is essential but not yet done. The first Law is the BRIEFPOSTORDNUNG, "1838 RGB302" (which means: Reichsgesetzblatt number 302 of 1838). This prescribes in great detail all aspects of the letter post. "1850 RGB149" covers the introduction of adhesive stamps. 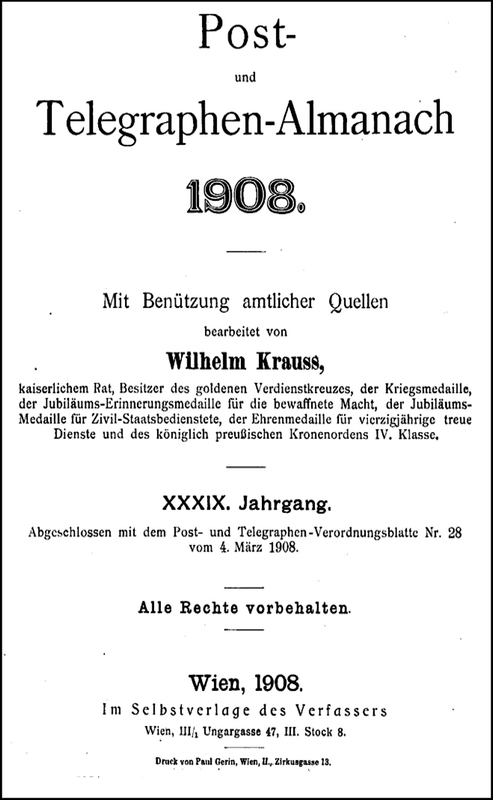 Various changes were made by various laws, until 25 Nov 1899 when RGB231 prescribed the changes caused by the new currency and introduced an 8-page POSTTAXORDNUNG for inland mail, effective from 1 Jan 1900. 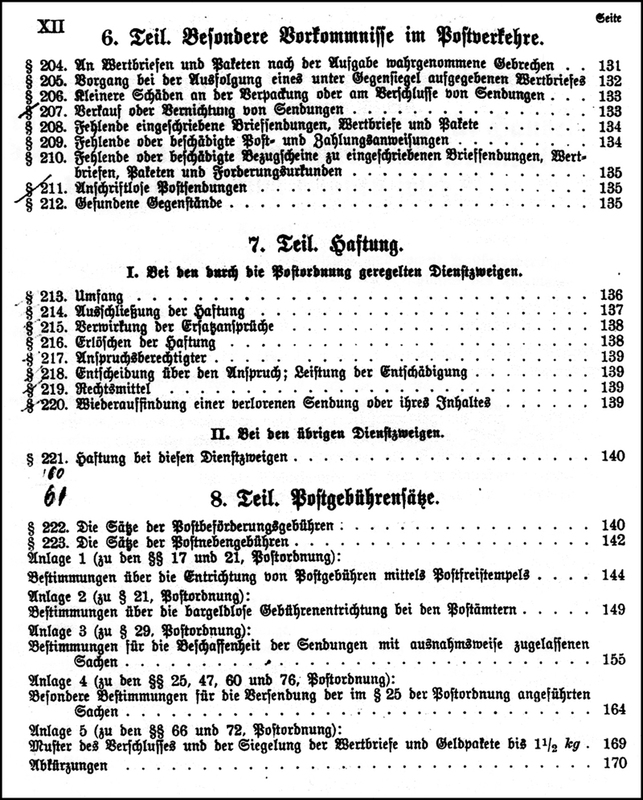 Amendments in 1902 and 1905 were followed by a new 6-page Posttaxordnung, 1906 RGB251. Conveniently, it gives the RGB references of the previous Posttaxordnung and its amendments, which it repealed. 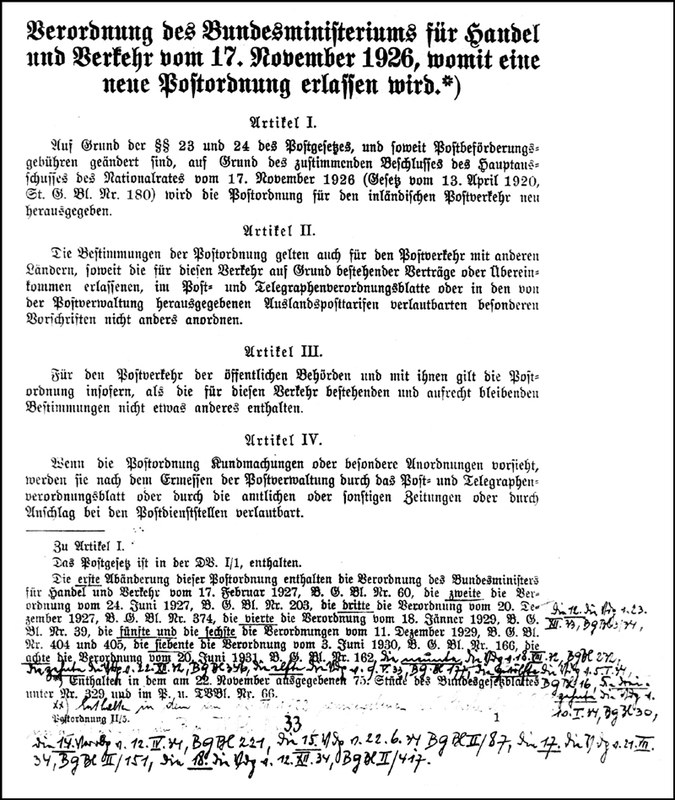 It in turn was on 22 Sep 1916 replaced by the POSTORDNUNG of RGB317, which had grown to 82 pages; it repealed "all previous laws" without listing them. This "new starting point" may be why many subsequent laws refer back to it. 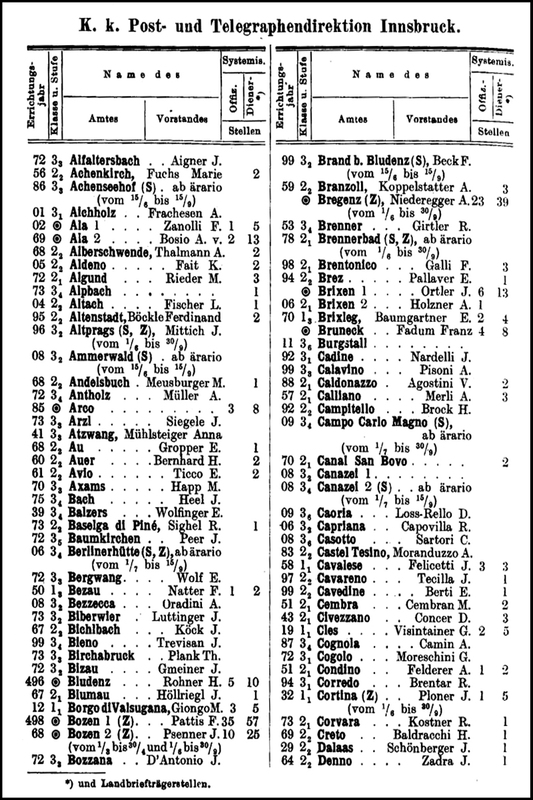 17 Nov 1926 saw the issue of 64-page BGB329, a new Postordnung listing and repealing its predecessors. One of its concerns was the change to Schilling currency. Amendments appeared in 1927, 1929, and 1930. It seems that in 1931 the 1926 Postordnung was reprinted (perhaps for internal use only) in a version incorporating all the intervening amendments; see the discussion below under "Dienstvorschrift". Further amendments appeared until the Anschluss. Careful cross-checking of the text shows that (for the 1926 issue at least) each amendment applies to the Postordnung as previously amended; ie they are cumulative. That means that a researcher who misses an amendment can fall into error. All of the above BGB were, we believe, reproduced verbatim as Post Office instructions, mainly Postverordnungsblatt. This practice persisted until 1938. 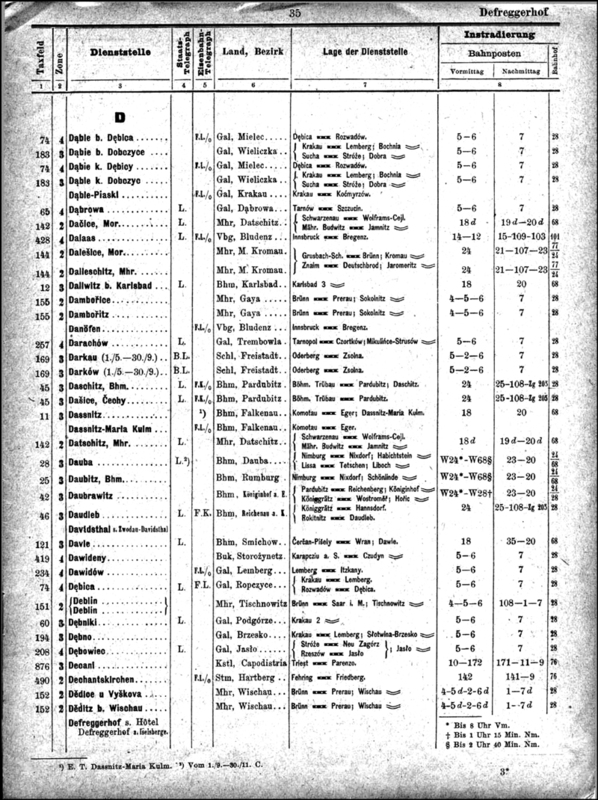 The next illustrations show the Verordnung des Handelsministeriums of 13 October 1909 giving the details of a rate reduction for Braille items in the inland post; and a subsequent Verordnungsblatt of 1910, extending it to Bosnia-Herzegowina. As the Verordnung des Handelsministeriums is dated 13 October 1909, was published on 31 October, and came into effect on the 1st of November, ie the day after publication, it is unclear how the postal staff knew in time. This oddity is quite often found, and remains without factual explanation. 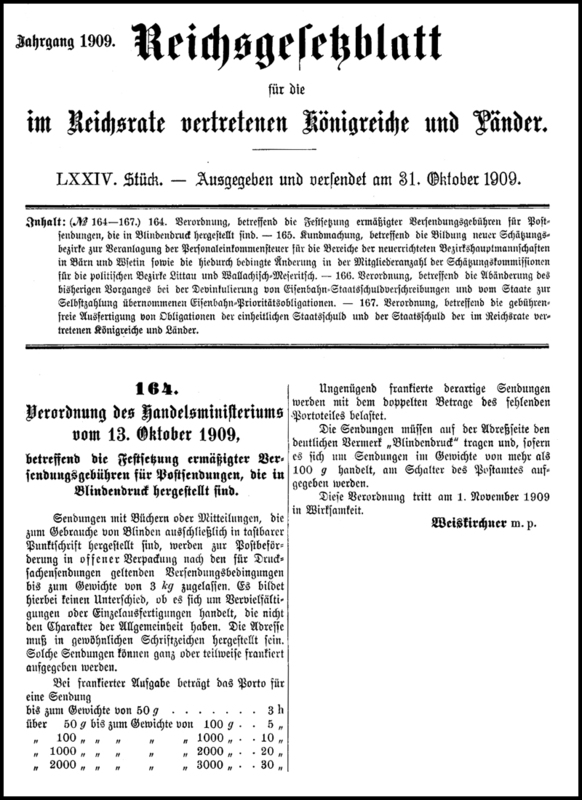 The Reichsgesetzblatt of 31 October 1909 with the Verordnung des Handelsministeriums of 13 October giving the details of a rate reduction for Braille items in the inland post which came into effect on the 1st of November. These were issued by the k. k. Handelsministerium (the Ministry of Trade, responsible for postal matters) in Vienna. extending the special Braille tariff to Bosnia-Herzegowina. Very few collections exist and not all of these are generally accessible. Sometimes, a change is announced after its date of introduction, posing the question "how did the Post Offices know about it so that they could implement it on the correct date?" Postverordnungsblatt are a primary source for Austria-wide regulations, instructions, & international postal matters. The Postal Directorate in Innsbruck issued its own versions of a few pre-1894 decrees. From 1895 these form an important secondary source for local events, useful for verifying the Zirkularverordnungen that are discussed below. A virtually-complete series of Postverordnungsblatt is in the Library of the Vienna Technical Museum. It's essential to arrange (eg by email) for the volumes you need to be brought from the store to the reading room, which takes 2+ working days. Each year's book is typically 1-2 inches thick - don't be overambitious! Note also that the library's opening hours are less than those of the Museum; and that entry to it is free if you ask. As always, a passport can be useful. Photocopying is normally available: buy a card at the desk and ask for guidance on using the machine. 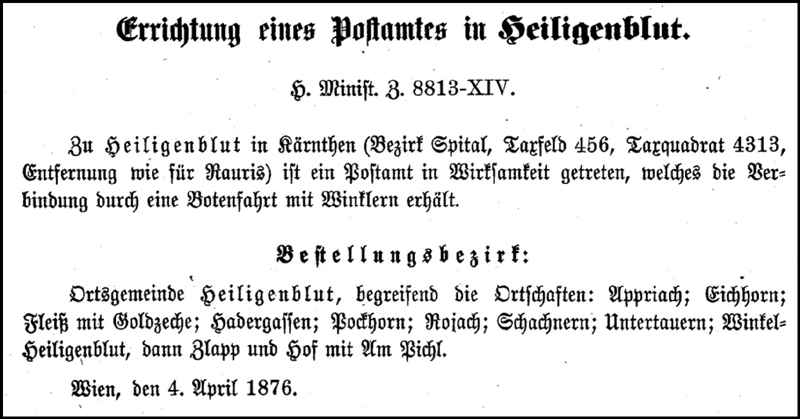 Example: PVOB of 4 April 1876 concerning the opening of a Post Office in Heiligenblut. 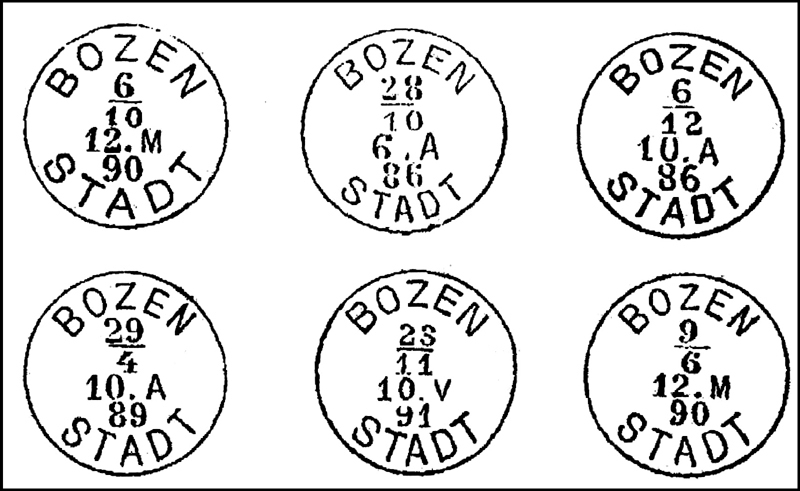 Note the Taxfeld and Taxquadrat numbers; these were used in the calculation of postage rates. Not easily accessible as they are in private hands. Postamtsblätter are a primary source; the Decrees etc referred to can be cross-checked from elsewhere. 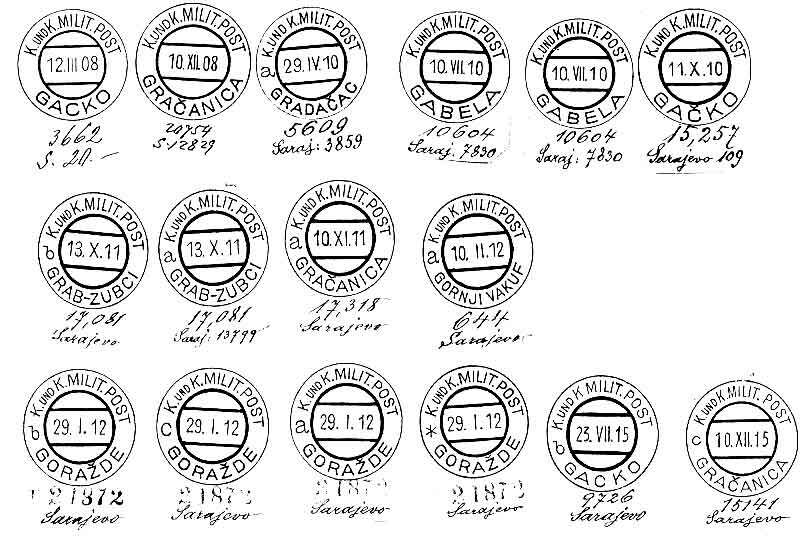 The file numbers and dates are those of the Innsbruck Postal Directorate, and may well differ from (usually, be later than) the corresponding dates in documents from Vienna. 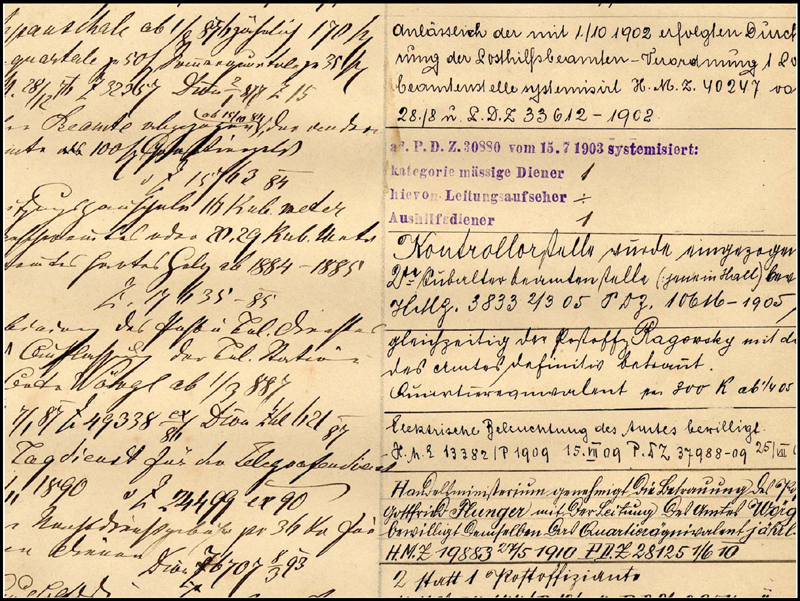 Zirkularverordnungen form a primary source for local postal history; sometimes they can be cross-checked with the corresponding Verordnungen in the PVO or Postamtsblättern. A comparison of creation dates of several Post Offices after 1894 between PVO and ZVO shows that the ZVO dates are mostly earlier than those of the same post-office given in PVO. Such ‘creation dates’ do not tell when an office started effective operation. Our conclusion is that the dates given in PVO may be considered as a more or less close estimate of the start of operations. 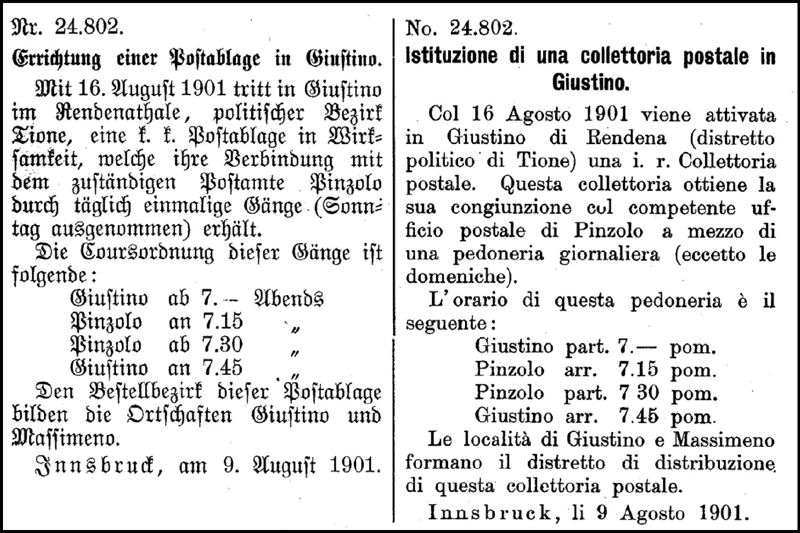 Because the Innsbruck Directorate covered Süd-Tirol, some instructions (such as this for the opening of a Postablage) were produced in dual-languages: German and Italian. These Instructions also served to keep postal employees in touch with their colleagues (promotions, retirements, dismissals and deaths appear) and to advertise posts to existing staff. The Post-Almanach is a compendium of all the information that a postal employee might require. 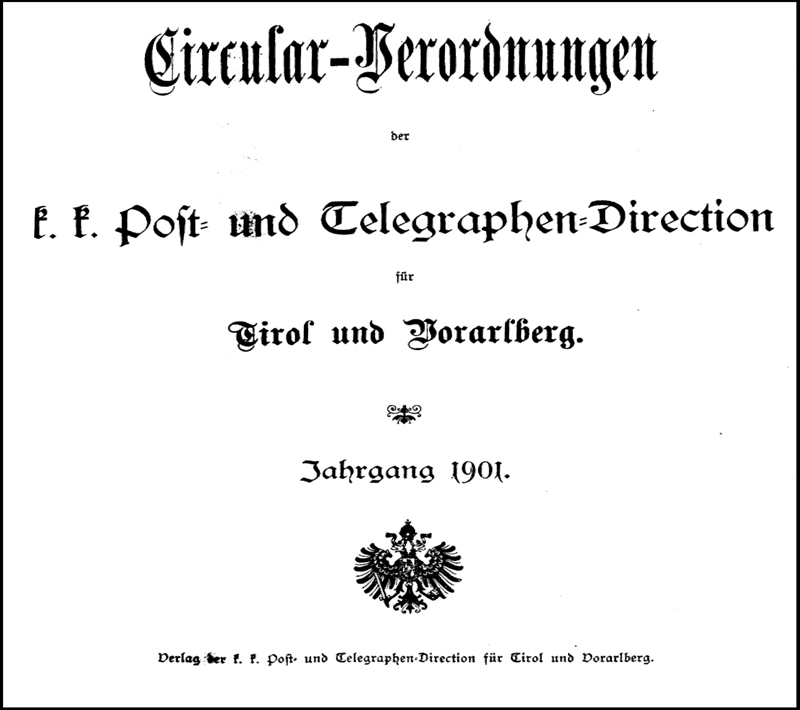 Up to 1877 it was called the "Post-Beamten-Kalender"; then it became the "Post- und Telegraphen-Almanach" or the "Post- und Telegraphen-Status". It contains much information of interest, difficult to find elsewhere; it is a surprisingly good source for the instructions for special duties. Dates and names need cross-checking elsewhere. The chapter titles keep changing, as does the physical format. The changes in the structure and arrangement of the contents make a systematic study difficult. For 1909 & 1911, only Part 1 has been found. 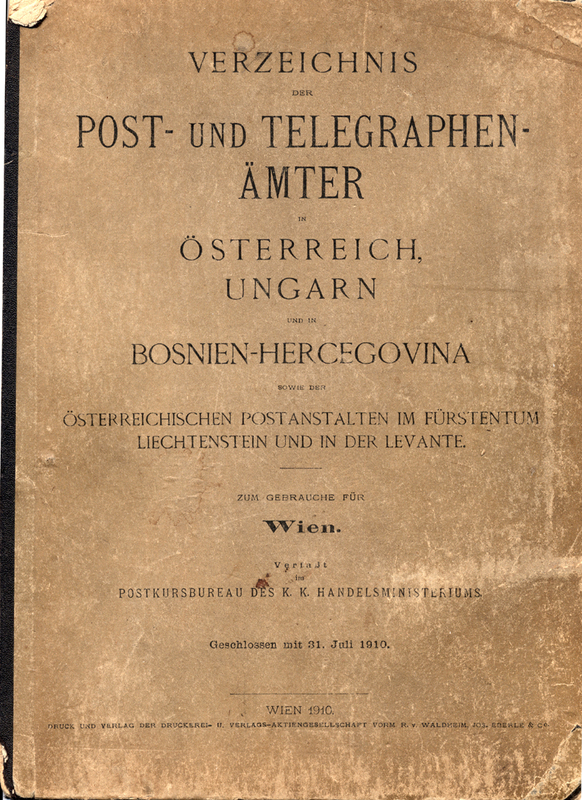 Extensive searches (by PKMI) in the Staatsarchiv, Technisches Museum, Bibliotheca of all Austrian universities, and the Postarchiv have led to the conclusion that Part 2 of the 1909 and the 1911 issues of the Post-Almanach seem not to have been produced. 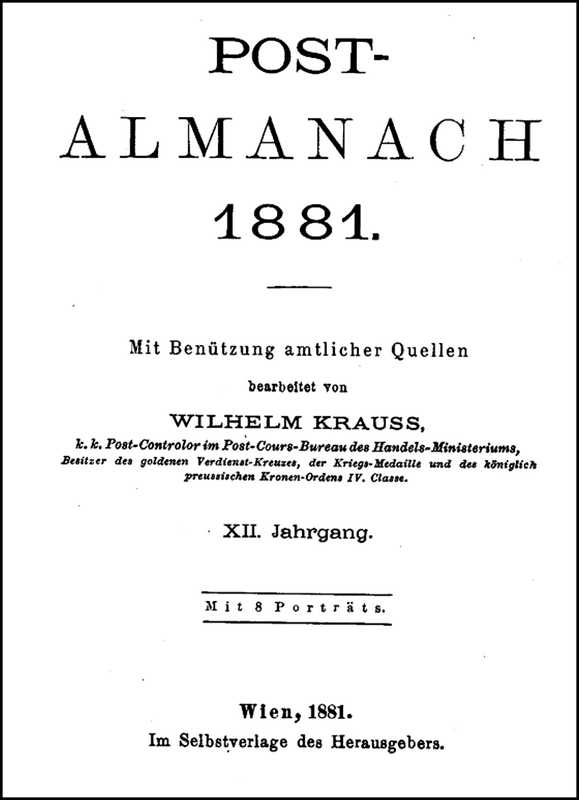 The 1881 Post-Almanach is 105x140 mm with 173 pages. 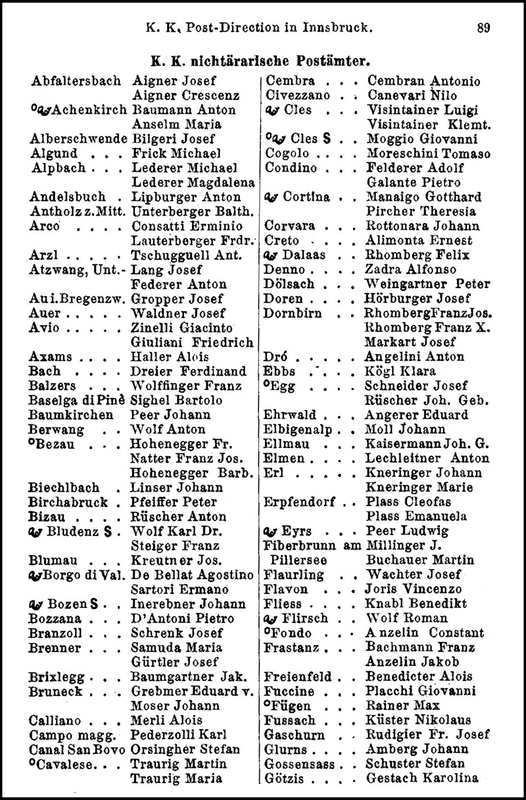 The above page is from the 1899 issue; it lists the k. k. nicht-ärarische offices attached to the Innsbruck Directorate (note the inclusion of Liechtenstein); their date of opening; the income in 1897 from postal and telegraphic transactions; and the name of the person(s) in charge. A page of the 1908 list of Post Offices. Next to the year of opening of each office is the Class and Ranking, the name of the person in charge, and the numbers of official positions. Post Offices were ranked by income, and divided into three 3 Klassen (categories), I (the top), II, and III. The head of a class III post office was a Postexpedient. There is a subdivision (Stufe) from 1 down to 6, depending on the income of the office. A newly-opened post office was always III/6 and depending on its income in the following years it could progress up the ranking to III/5 & on to III/1. 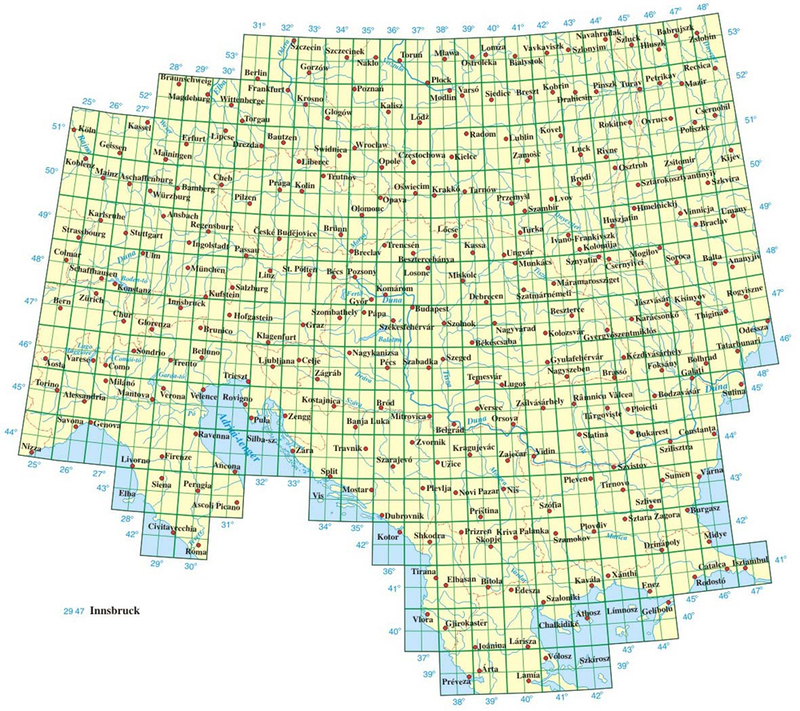 A prosperous post office could also jump straight to III/4 or III/2; it didn’t have to pass through every subdivision. At a certain income the head of a post office had to be a Postmeister (who had to pass additional exams). In Class II there were subdivisions II/4, II/2 and II/1. (A II/3 has not been seen so far.) Class I post offices had a similar classification from I/4 to I/1. 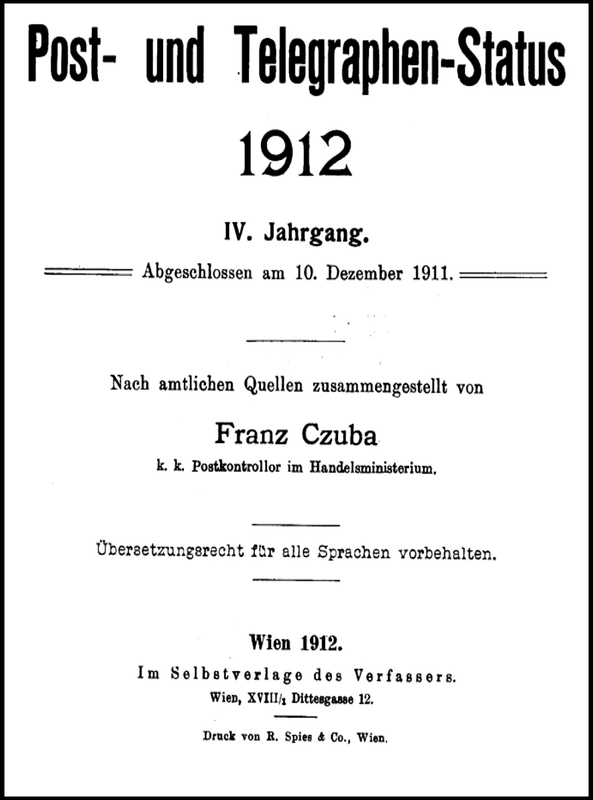 Title page of 1912 Post-Almanach, published by Franz Czuba. 160 x 230 mm; 611 pages. 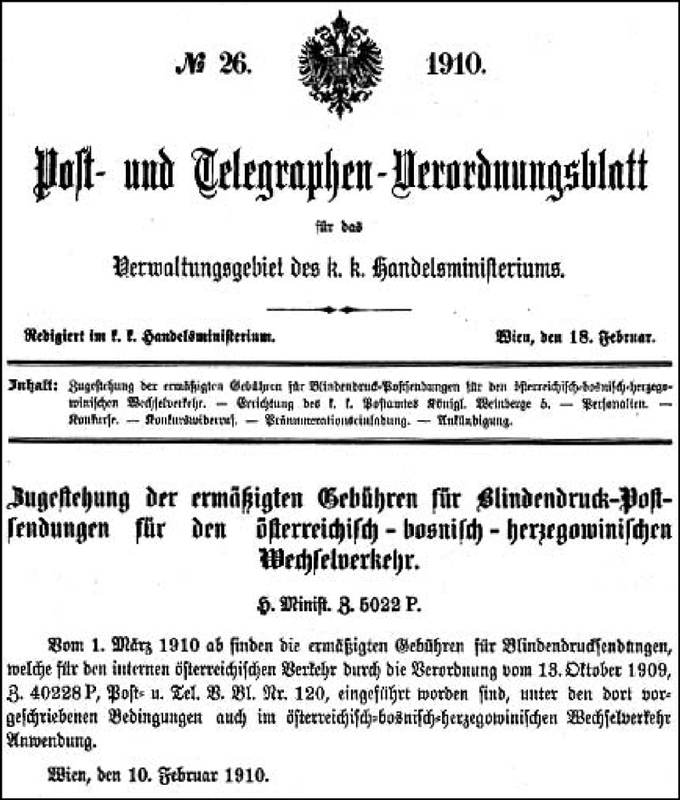 In Innsbruck a newspaper was produced called the "Bote für Tirol und Vorarlberg". It contained laws of the Tirol government, notices about postal matters, and similar material. The Land Archives (eg the Tiroler Landesarchiv) often contain correspondence between local government, central government, and the local and central postal authorities. That is, between the Statthalterei (which later became the Landeshauptmannschaft), the Handelsministerium (Postal section), and the Postal Directorates. The correspondence can concern letters from communities asking for a new post-office and/or postal routes; the opening of a Post Office or Postablagen; the appropriate name for a new post-office or Postablage; orders for postmarks and others. One can find agreements between Postal authorities and private persons on a Special Post Office. Offices opened for military manoeuvres, and others whose opening was agreed but prevented by wars (especially in 1914) also leave traces in these archives. Useful index terms are Post, Telegraph and Telephon. Various members of PKMI in Austria and APS in GB and USA have identified several Directories and Lexicons issued to assist the work of postal staff and customers – and a few physical copies exist in our hands! 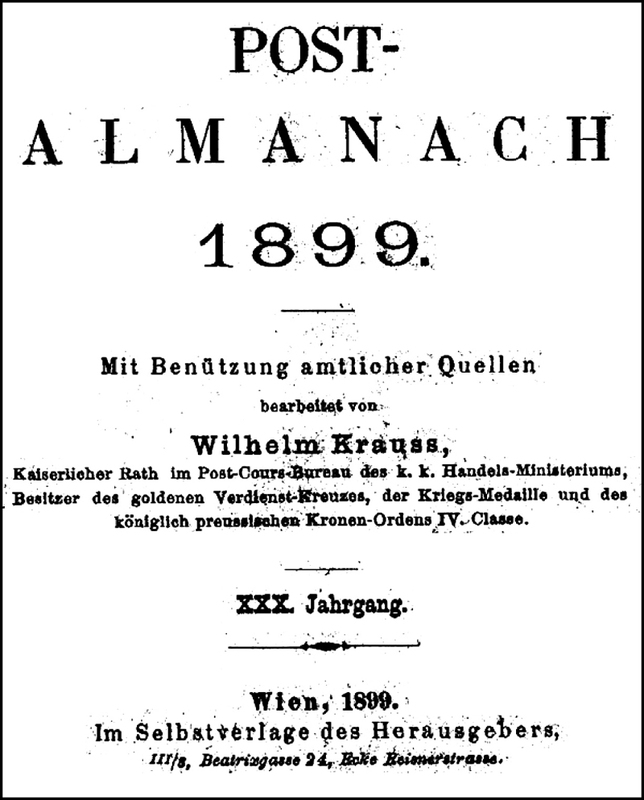 The 1906 book entitled Allgemeines Postlexicon was published by the KK Handelsministerium and contains 1568 pages. As well as listing localities and alternative names, it gives (inter alia) Province; Bahnhof; Bezirksgericht; Ortsgemeinde; and the nearest post office. The Hungarian equivalent, A Magyar Szent Korona Országainak Helységnévtára, was published in 1907 by the Hungarian Trade (?) Ministry and runs to 1541 pages. The information given is similar; it makes use of "strange graphic symbols" that impede optical character recognition. In 1910 the Trade Ministry published a Directory of all Post Offices in the Empire. This is a key reference work; unhelpfully it uses many unusual symbols which makes a searchable electronic version almost impossible to construct. The APS has published a CD containing enhanced scans of the 550 pages. 1910 Postkursbureau des k.k. Handelsministeriums Verzeichnis der Post- und Telegraphen-Ämter in Österreich, Ungarn und in Bosnien-Hercegovina sowie der österreichischen Postanstalten im Fürstentum Liechtenstein und in der Levante Druckerei- u. Verlags-aktiengesellschaft vorm. R.V. Waldheim, Jos. Eberle & co.
1907 Lexicon of "everywhere in Hungary"
the "native size" is A2: print with care! copies of these can often be purchased at Freytag & Berndt, I.Kohlmarkt, Vienna. 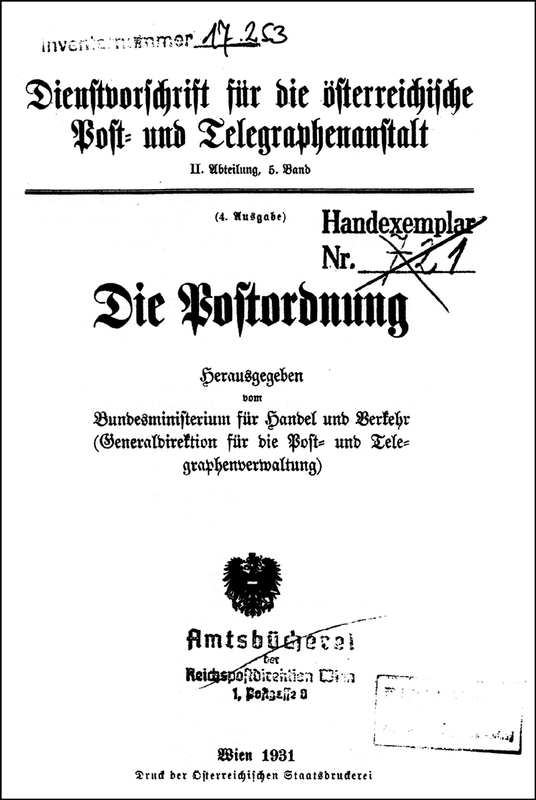 In 1931, a manual was published by the Trade Ministry, entitled "Dienstvorschrift für die österreichische Post- und Telegraphenanstalt / II. Abteilung 5. Band 4. Ausgabe / Die Postordnung". 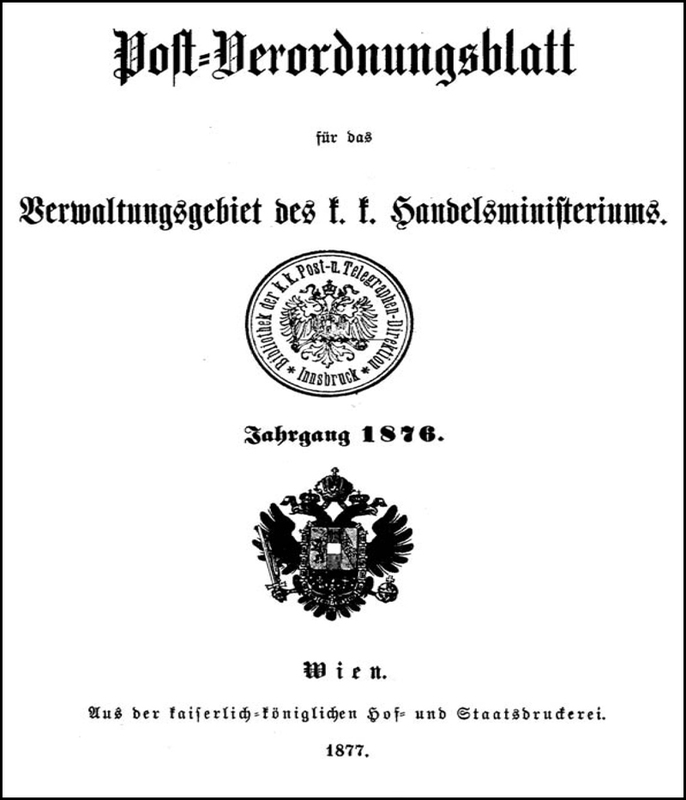 It contains a 12-page contents list followed by 223 sections in 170 pages, and according to Dr C Kainz was a reprinting of the 1926 Postordnung incorporating the subsequent amendments. As it is the 4th edition, there must have been previous editions (! ), and sight of these could be informative. It is not known to us if the Dienstvorschrift was issued routinely; nor what if any relationship it had to the Dienstbücher discussed next. At least one other Dienstvorschrift is known, issued in 1929 by the "BM f. Handel u. Verkehr, Generaldirektion f. Post- u. Telegraphenverwaltung" and titled "Dienstvorschrift f. d. österr. Post- u. Telegraphenanstalt II. Abteilung, 2. Band / Das Portofreiheitsaufhebungsgesetz nebst den Durchführungsverordnungen". All amendments promulgated in the BGB from 1926 to 1934 are included in the above lists. There are later amendments, but evidently they were not added to this copy of the document. In 1938 things changed somewhat, and 1938 BGB036 concerning inland rates is signed by Seyss-Inquart, Reichstaatshalter in Österreich. 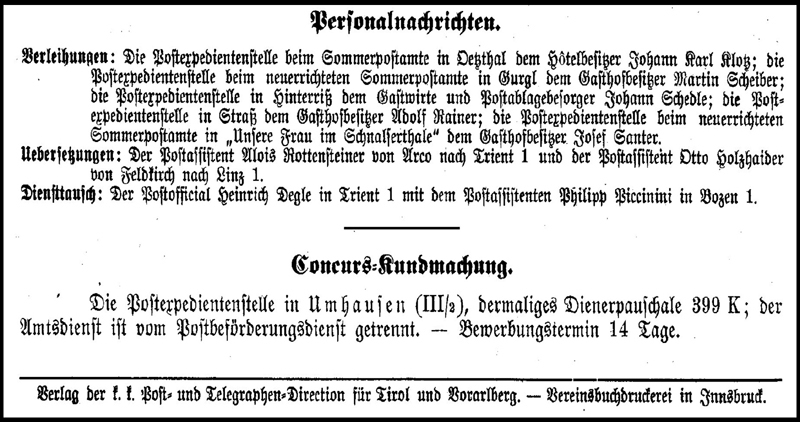 "Instruktion für die Staats-Telegraphenboten in Wien" (1875); re-published as part of "The Pneumatic Post in Vienna", APS 2005. "3. Dienstanweisungen für die Zusteller bei den Postämtern", Wien 1947. These are referred to, so must have existed somewhere! These are multi-page tables of rates for postage, for un- or underpaid mail etc. Many but not all are available; research continues on the question, "did the first issue after WWII exist?". A detailed and comprehensive survey and appraisal of the published philatelic political and historical literature would also be useful; but this is not it. Philatelic literature on Post Offices (Müller, Klein, Sottoriva etc). The coding systems for cancellations do not provide the differentiation required by the specialist; conversely, they can introduce a distinction which did not exist in reality; and can be so complex as to be unmemorable, making it almost impossible to create a "wants list" suitable for use at a stamp dealer. You can’t conveniently carry a 5-volume listing in one hand! The book "Postablagen in Österreich" by Gerhard Kühnel, in the green-covered second edition, is the indispensible source here. All its entries for Tirol have been verified as correct. Work by PKMI in the ZVO & Postamtsblätter has revealed new aspects of Postablagen: details exist such as the route-connections with the postal system, the delivery areas and frequencies, and sometimes the operator and her or his income. In 1960 Erhard Görig made and typed the "Postaemter-Verzeichnis der Republik Oesterreich", which is a 195pp list of all post offices within post-WWII Austria, extracted from the Post Office listings. 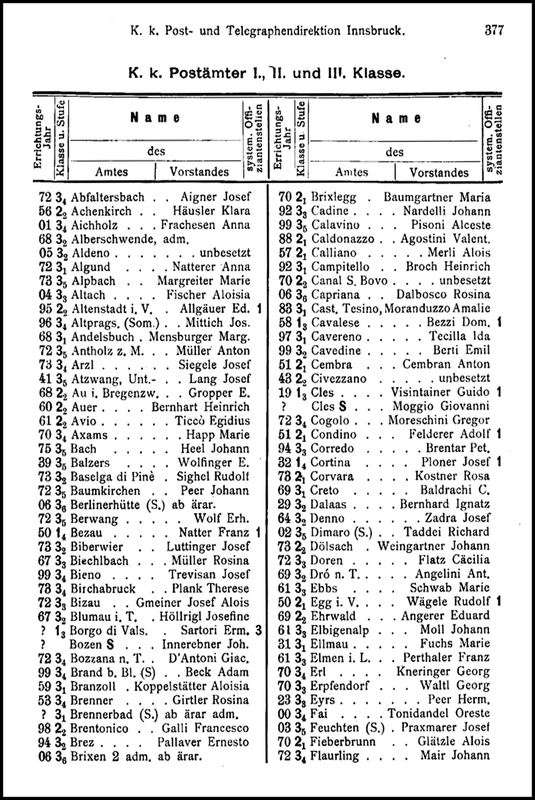 Then in 1963 he produced the 140-page 9527-entry "Verzeichnis der OT-Stempel die in der Gravuranstalt Joseph Schatz in den Jahren 1908-1938 ausgeführt wurden"; that is, "List of the cancellers created and/or repaired by Joseph Schatz' engraving works between 1908 and 1938". Schatz was one of the Official Canceller Repairers. As with the Stempelprotokollbuch, some of the cancellers were made and issued but seem never to have been used (eg the office didn't actually open, for reasons including "permanently lost to the Russians in 1918"). In 1906, Herr Johann Bartl published "Handbuch für den ausübenden Postdienst in Österreich" in competition with the Post-Almanach. Unfortunately, while it is very useful it is also very scarce! The JewishGen Communities Database and JewishGen ShtetlSeeker web site at http://www.jewishgen.org/Communities/ provides useful resources to search for places by name in Central and Eastern Europe, using various search criteria; and to list all localities within a certain distance of a given latitude/longitude. Many countries and regions have flourishing expatriate communities, notably in the USA. It’s always worth entering the name of some obscure location into sites such as Wikipedia or Google or http://austria-lexikon.at/ and seeing what turns up! 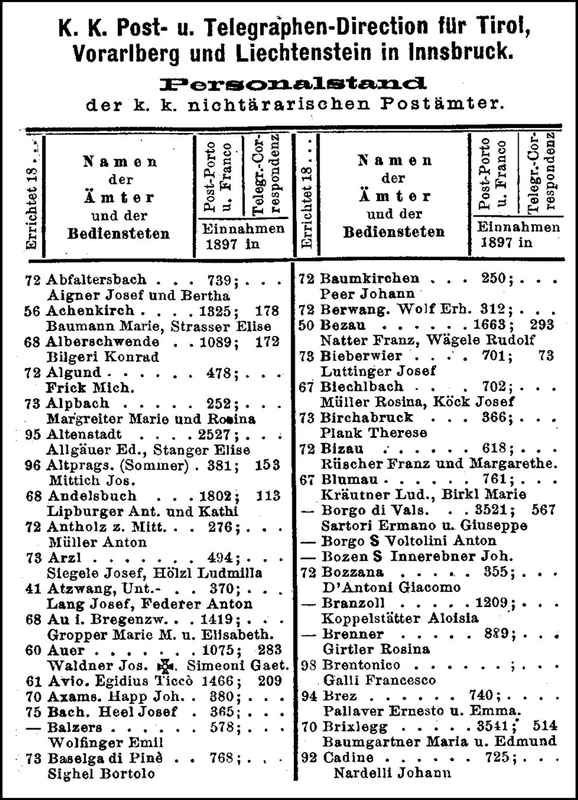 Weis & Stern: Eröffnungsdaten der Postämter, Telefonsprechstellen und Telegraphenstationen in Nord- und Südtirol, Vorarlberg und Liechtenstein bis 1900. This uses data from "Boten für Tirol und Vorarlberg" to list the opening dates of post-, telegraph- and telephone-offices. See their web site at http://www.phk-merkur-innsbruck.com/ for more details.